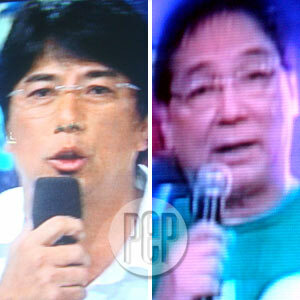 The ongoing feud between Wowowee host Willie Revillame (left) and Eat Bulaga's Joey de Leon (right) stole the thunder from the soap operas and other shows this week. Nothing beats a real-life drama presented in full color. The battle between Eat Bulaga! and Wowowee became more than just a matter of two noontime shows slugging it out for most viewership. As it turned out, the escalating feud involving Joey de Leon and Willie Revillame gave the public another reason to surf channels during siesta hours. In the recent survey conducted by AGB Nielsen Philippines among Mega Manila households from August 28 (Tuesday) to August 30 (Thursday), Eat Bulaga! maintained its strong showing in the daytime slot, although controversial Wowowee is still very much into the race. Last Wednesday (August 29), Eat Bulaga! carried a slim 22.7 percent lead against Wowowee's 21 percent. It was the same day Willie publicly spoke about the "Wilyonaryo" controversy and his disgust at Joey for allegedly making snide remarks to fuel public doubts even more. Yesterday, August 30, Eat Bulaga! gathered a 24.1 percent marker as Joey answered Willie's remarks at the tailend of the program. Wowowee, on the other hand, got 22.6 percent to place third overall during daytime. Taiwanese soap opera Meteor Garden continues to have its way against Margarita and most of the afternoon programs. It maintained its grip on the number two spot yesterday (August 30), except last Tuesday (August 28) where it was upstaged by Kung Mahawi Man Ang Ulap, which came up with a 20.6 percent rating. Marimar continues reigned on the primetime slot. Its rating shot up to 35.7 percent yesterday. After trailing behind for several days, Mga Mata Ni Anghelita dramatically improved its standing as it overtook the lead against rival Kokey and placed second overall for two consecutive days, August 29 and 30.